We use the phrase ‘Storm of Hope’ to describe a form of discipleship that enables us to respond to the cry of the wounded Earth. ‘Storm’ refers to the sorrow we feel in our hearts at the signs of the Earth’s demise and most especially stormy consequences we face as a result changing our lives to tread more lightly on the planet, thus living against the flow of the dominant culture. 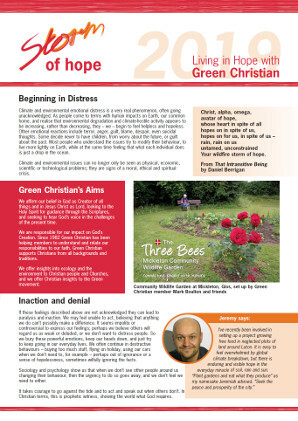 ‘Hope’ is the spiritual energy that empowers us to choose to engage in the discipline of faith, resistance and worship that allow us to safely feel the pain of ecological devastation and yet sustain our passion for activism. 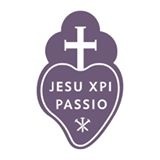 ‘Storm of Hope’ is a ‘way of being’ that enables us to grieve but still remain sufficiently angry, humble and hopeful to be true to our calling as faithful Earthkeepers. your wildfire storm of hope. 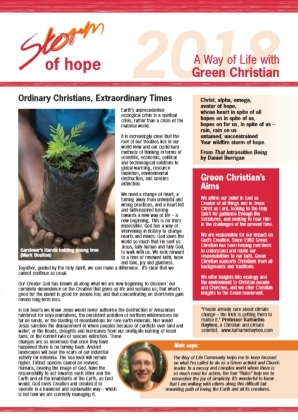 Storm of Hope is published annually to promote the current concerns of Green Christian and its members.